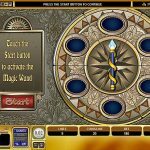 Witches Wealth is a video slot game brought to us by Microgaming. In general witches are connected with something evil, but not in this case, the more witches you see on the reels the better for your bank roll. The only thing that the witch Serena is scheming in this game is how to bring more prizes to you. 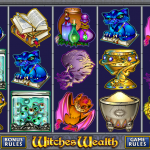 In Witches Wealth video slot game Serena the witch is a wild, the cat is a bonus symbol and the bat is a scatter symbol. Serena, the wild, substitutes for all the other symbols except the cat. In this game the wild even substitutes for the scatter. Mr. Twinkles, is the key to both bonus rounds Spinning Wand Bonus and Flying Rescue Bonus. This symbol is rather unusual; it is a blue cat with green eyes. Landing 3 or 4 symbols on an active pay line will take you to play a mini game where you need to spin the wand. You can either win a cash prize or activate the next bonus round, Flying Rescue. If you do not activate the bonus this way, you can also activate it by landing 5 cats on an active pay line. Serena needs to fly from one side to the other, grab the cat and take it with her. At the same time she needs to avoid some heavy objects on its way and the further it ends, the better. 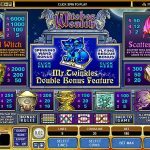 Witches Wealth is probably one of the best witch themed online slots from Microgaming. Some might say that the bonus round is not interactive as many would prefer but still those witches can bring some lucrative amounts if they want. This is definitely a game that is worth the try. If you like spinning the wheel and big prizes then consider playing Wheel Of Wealth Special Edition a 5 reel slot by MicroGaming.